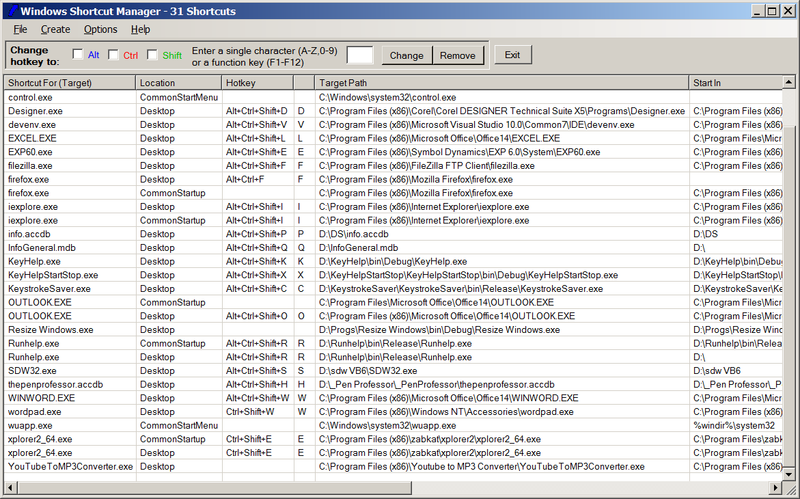 The purpose of this utility is to manage local Windows shortcuts and their hotkey assignments. Here is the main window for the program. A local Windows shortcut is a small file on your computer that is used to start an application or open a document. The target of the shortcut is the application or document that is opened when you invoke the shortcut. If you are like me, you have dozens of shortcuts with hotkey assignments and it can be quite difficult to keep track of these hotkeys. Windows Shortcut Manager will show you all of your shortcuts and their hotkey assignments and allow you to change these assignments. a function key (F1-F12) with or without modifiers. Just unzip the downloaded ZIP file (link below) to a folder of your choice and double click the file rpiShortcuts.exe with the mouse to run the program. If desired, you can use the program to create its own Desktop shortcut and assign a shortcut key (such as Ctrl+Alt+Shift+S) to run the program. You can tell the Windows Shortcut Manager which of these folders to search through the Option menu. You can tell Windows Shortcut Manager which of these items you want displayed through the Option menu. View and sort a complete list of shortcuts with their hotkeys. Click a column header to sort by that column. Add or change the hotkey for any shortcut. Select the shortcut and use the controls at the top of the main window to reassign the hotkey. Create a new Desktop shortcut. Choose 'Create Shortcut' under the Create menu. Save a list of all of your shortcuts and their hotkeys. Choose 'Save List' under the File menu. Delete a shortcut (send it to the Recycle Bin) Select the shortcut and hit the Delete key. Download a full-featured 14-day trial version of Windows Shortcut Manager. If you like my Windows Shortcut Manager, you can buy it for $6.95. To purchase by credit card through PayPal, click the PayPal image below. Once payment has been made, PayPal will notify me and I will e-mail you the serial number required to remove the time limitation.